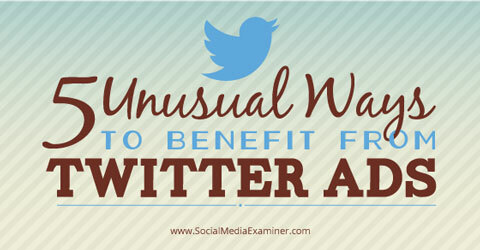 Are you using Twitter’s advertising and remarketing options? In this article you’ll discover five Twitter advertising tactics to help you meet your goals. Find out how you can benefit from using Tiwtter ads. If you have an online shop as part of your website, you know how frustrating it is when visitors abandon the shopping process. With Twitter tailored audiences, you have a chance to recover those sales by remarketing to buyers who didn’t complete a sale. 1. Create a tailored audience that only includes users who went through the shopping process on your website but didn’t complete the sale. It’s possible to target people who haven’t completed their purchases with you. Image: Shutterstock. 2. Use your CRM system to create a list of all users who have completed the purchase process successfully, and include their email addresses in the list. 3. Export the list from step 2 into a CSV file. Include only one column of data and no headings in row 1. 4. 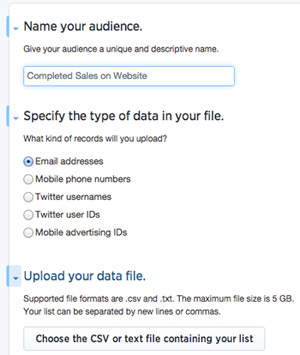 Import the new CSV file into Twitter ads by going to Tools > Audience Manager > Create New List Audience. When prompted, name your list, select the format of your data (email addresses) and upload the CSV file you created. You could also use this technique with other types of data that you may have in your database. 5. From the Campaigns menu, create a new campaign and select Tailored Audiences as your targeting method. There are four main targeting options for Twitter ads. 6. Select Website Visitors as the source of your tailored audience, and choose the audience you created previously that includes all visitors to your website shopping process. Targeting to similar users would make your campaign less effective. 7. Under “Limit targeting by excluding tailored audiences,” select Lists and choose the list you uploaded in step 4. Limited targeting can be used with lists as well as with website visitors. 8. Complete the rest of your campaign settings and you’re ready to go! If you’re going to use this tactic, you should know that website audiences cannot be populated retroactively with past visitors. This means it could take some time until you have an audience large enough to run a campaign like this. Additionally, Twitter can’t track users who don’t allow cookies on their browsers, which means your remarketing efforts may miss some users from your website audience. You also could miss users if the email address they gave you during checkout doesn’t match the one they have registered with Twitter. In those cases, customers who have completed sales may be retargeted in your campaign. Many companies integrate newsletters with their social media activities as a way to communicate important news to their subscribers, so open rates are important. If your open rate is down or isn’t as high as you’d like, you can use Twitter tailored audiences to retarget to specific subscribers who aren’t opening your emails. To get started, identify which subscribers aren’t opening your newsletters. Most mailing platforms include tools to export these subscribers into a Microsoft Excel file (.xls). Export a list of subscribers based on their engagement with newsletters. 1. Export the list of subscribers who have not opened your newsletters. 2. Create a new Excel spreadsheet with two tabs. 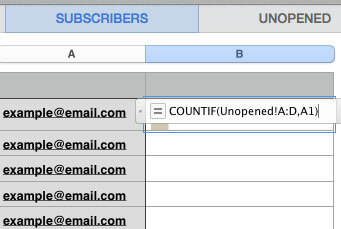 Name the first tab Subscribers and paste all email addresses from your list in column A. Name the second tab Unopened. Treat each column as a placeholder for a monthly newsletter. In each column, paste the emails of subscribers who didn’t open one of your newsletters. For example, if you’re evaluating your last four newsletters, then you should include data in columns A, B, C and D.
Your spreadsheet should look something like this. 3. Return to the Subscribers tab. In cell B1, insert the following formula: =COUNTIF(Unopened!A:D,A1). Drag that formula along column B to apply to your entire subscriber list. Column B in the Subscribers tab now shows the number of times each user didn’t open any of the newsletters you’re analyzing. 4. Filter the data to show only those subscribers you want to target (in our example, it would be only those who didn’t open the last four newsletters). 5. Copy and paste these records into a new spreadsheet, save it as a CSV file and upload it to Twitter as explained in the previous section of this article. When you create your Twitter campaign, choose Tailored Audience as your targeting method, and List as the tailored audience source. Select the list containing your target audience and complete the rest of the campaign settings. Finally, create an ad targeted only at this particular audience. Remember to include a link to your most important content (e.g., the most recent newsletter they didn’t open). It won’t be tough to see how your click-through rate (CTR) improves with this tactic. It’s not uncommon for businesses to use a Twitter ad to drive traffic to a website—that’s a big part of what ads are for, right? You include a short URL in a promoted tweet, maybe throw in an image for extra appeal, post it and expect engagement. Unfortunately, many times the URL gets diluted within the tweet (as you can see in the image below). Images are engaging, but distract attention from the link, which reduces CTR. You can avoid link dilution by using a Twitter website card. The image within the card is clickable and you can include a call-to-action (CTA) button to encourage people to complete your desired action. The click-through process is seamless and your link isn’t overlooked. 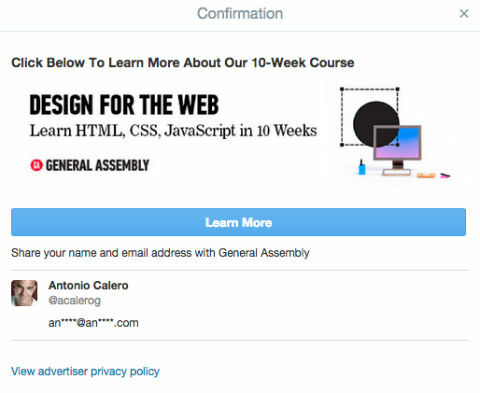 To create a Twitter website card, go to the main Twitter Ads page and click Creatives > Cards. Start by creating a new card. Twitter cards include a clickable image, a CTA button and a link. Now that you have your Twitter website card, you just need to attach the card to the tweet you’re using as your ad. You can include additional text in the main tweet. You display content to leads. Some of those leads decide to click through and end up on a landing page with a form. A few leads complete the form. You send those leads a confirmation email. Some, but not all, of the leads confirm their data. User behavior analysis has demonstrated that with each step of a process, a certain number of users disengage and drop off. As such, longer processes usually have a lower conversion rate than shorter ones. Using a Twitter lead generation card cuts the traditional online lead generation process from five steps to two. With a lead generation card, you present information to leads (step 1) and if they’re interested, they click (step 2). When users click on your card, Twitter automatically completes their contact details with information from their Twitter profiles. This means a two-step verification process isn’t required. You’ve essentially done away with steps 2-4 in the funnel illustrated above. Lead generation cards collect qualified data directly from a user’s Twitter profile. 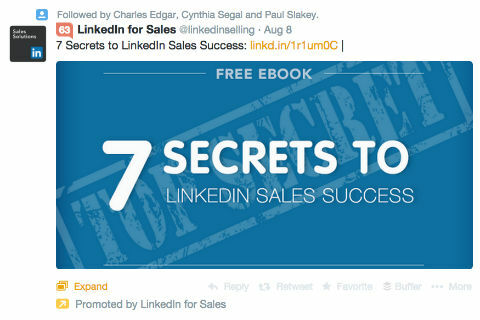 To create a Twitter lead generation card, go to the main Twitter Ads page and click Creatives > Cards. When leads share their information, Twitter stores those details in a list located in your Ads account. You can download the list from your Cards Administration panel any time you want. It’s normal now for people to watch television with their phones and tablets handy. We use them to talk with our friends (via social media) about a show we’re watching or to distract us during a commercial break. Twitter understands that behavior shift and offers advertisers the option to promote their business to users actively engaged with specific TV shows. Engagement could be either a direct conversation with users about the show or simply mentioning the show in their tweets. This ad option—Twitter’s Conversation Targeting—is easy to configure and allows you to target users engaging in TV show conversations right before, during and after the show. Conversation targeting is different from ad targeting and is much easier to configure. To use conversation targeting, go to your campaign creation window, choose Television in the Targeting area and select the TV market you want to target. Note this is not the actual location of your target audience, but the market where the show is broadcast. In the targeting method area, select the shows you want to target. Twitter will provide an estimate of how many users are currently engaged with each of the TV shows you selected. Complete the rest of your settings and you’re done. The size of the blue bubbles represents the size of the audience engaged with a TV show. Conversation targeting practically guarantees your message will be delivered to your target audience, because you know when they’ll be online and what their mindset will be. Twitter’s advertising tools are often overlooked in favor of other platforms, but that will change as businesses see the impact Twitter ads can have. I’ve listed a few ad options here, but there are many more to choose from. Combine the different ad types to develop powerful campaigns targeted directly to the people you want to reach. For example, create a lead generation card to be shown during certain TV shows. The unending combinations are perfect for A/B testing so you can find out what ads recapture the most sales or generate the most leads. What do you think? Have you run a Twitter ad campaign? 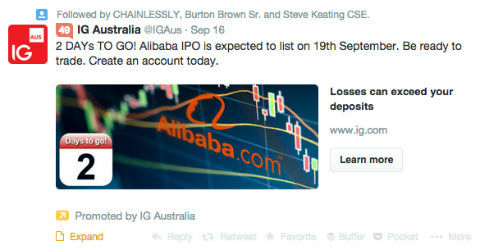 Have you seen any Twitter ads that captured your attention? Let us know in the comments below. 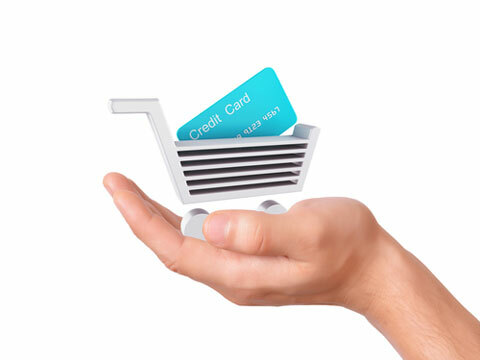 Hand holding a shopping cart photo from Shutterstock.